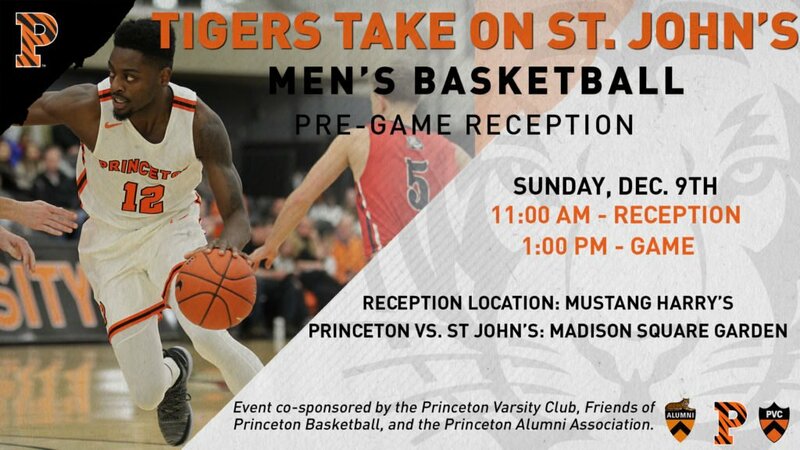 The Princeton Varsity Club, Princeton Friends of Basketball and the Office of Alumni Affairs invite you to join fellow Tiger fans for a pre-game basketball reception in advance of Princeton basketball’s game vs. the St. John Red Storm at Madison Square Garden on Sunday, December 9th. WHEN: Sunday, December 9th — 11:00am Tailgate, 1:00pm Game time. WHERE: Reception — Mustang Harry’s (352 7th Ave, New York, NY 10001); a short walk from MSG. Game — Madison Square Garden, New York, NY. WHAT: Enjoy great food, drinks, and company before cheering on the Tigers at MSG in the Big Apple! Stay tuned for a reception ticket link! $25 in advance for all PVC and Friends of Basketball members, and free for children 12 and under; includes food and beer/wine (game tickets sold separately – link below); tickets will be $25 for all day of registrants as well.